Hold your next meeting and presentation inside the epicenter of Chicago’s tech and startup ecosystem. 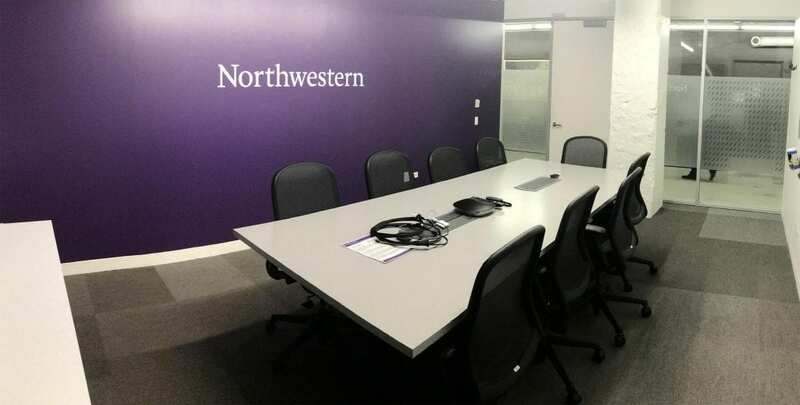 The Northwestern Conference Room at 1871 is located in the historic Merchandise Mart in downtown Chicago. Northwestern students, faculty, and staff can request to reserve this space for innovation and entrepreneurial focused projects and meetings. Co-work with your startup team for an offsite meeting, meet with mentors, or present to investors in one of the highest-ranked incubators in the US. Hours of Access are Monday-Friday, 9:00 AM-5:00 PM. To make a reservation, please complete the reservation form at the bottom of this page. Upon arrival at 1871, please tell the receptionist you have a reservation for the Northwestern Conference Room and give the name on the reservation. You will be given a key card to access the Northwestern Conference Room in exchange for your driver’s license or other identification. After your meeting, exchange your key card for your ID on your way out. Use of the Conference Room does not include use of the common space or other conference rooms at 1871 nor does it include 1871 member-only events and office hours. If those privileges are desired, you must purchase a membership directly with 1871. It is the responsibility of all visitors to work together to keep the space clean and orderly. If you notice any problems or low supplies, please email patking@u.northwestern.edu. 1871 is a co-working space for digital and tech entrepreneurs on the 12th floor of the Merchandise Mart in downtown Chicago. It houses Chicagoland startups, companies and other entrepreneurial institutions. 1871 is located at the Merchandise Mart at 222 W. Merchandise Mart Plaza, Suite 1212, Chicago, IL. Take the Orleans Street elevators at the west end of the building to the 12th floor and proceed to reception. Please contact Pat King at patking@u.northwestern.edu.